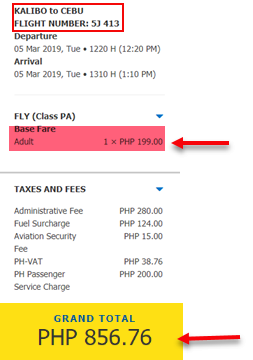 Check the new Cebu Pacific promo fares as low as P199 base fare for trips in 2019! This seat sale might be what you are waiting for. 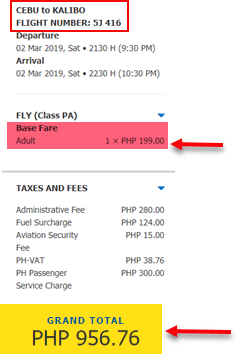 Cebu Pacific promo tickets from this sale are good for travel in January 15 to April 30, 2019. 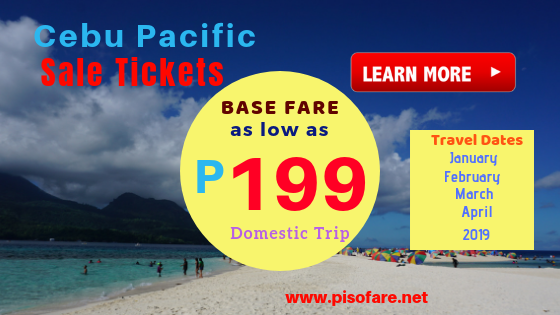 Book as low as P199 base fare for flights to select domestic destinations. Most of the sale tickets are from/ to Cebu, Cagayan De Oro, Clark, Davao, Iloilo. For international travel, Cebu Pacific base fare promos start at P999 for trip Cebu to Macau. Affordable fares also applicable for travel to Singapore, Hong Kong, Incheon, Tokyo. Promo selling period is until December 8, 2018 or until sale seats are available. Limited seats on promo! We shared below Cebu Pacific base fare promos Cebu to Kalibo/ Kalibo to Cebu. The Cebu Pacific base fare promos are good for one-way trip covering 7 kilos hand carry baggage for both domestic and international trips. Excluded are the Web Admin Fee, Taxes & Fees, Fuel Surcharge and Terminal Fees. Buy the low fares at Cebu Pacific ticket offices, booking offices and travel agents. Call the Cebu Pacific Reservation Hotline. Book only via accredited travel agents and booking offices. Be cautious in dealing with persons whom you do not know especially on Facebook. Hurry and book the Cebu Pacific promo tickets! Sale seats are limited and on a First Come, First Serve basis. For updates on Cebu Pacific seat sale 2019- 2020, piso fare and other airlines promos, Like and Follow us in Facebook: PISO FARE TICKET!